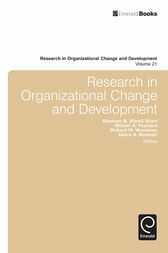 Research in Organizational Change and Development provides a special platform for scholars and practitioners to share new research-based insights. Volume 21 continues the tradition of providing insightful and thought-provoking chapters. Papers bring new perspectives to classic issues in the field such as organizational complexity, change leadership, emotional intelligence and interorganizational change.